One of the best cakes!! It is not complicated to make at all. 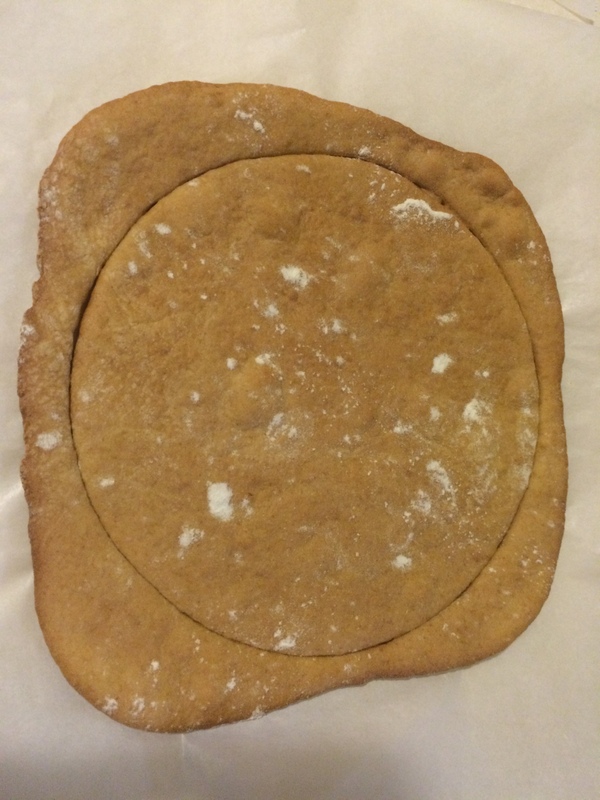 Melt few ingredients… make a dough… roll the dough… bake the dough circles…and assemble…simple!! Place baking soda and vinegar in separate small bowls. In a sauce pan add eggs, sugar and honey. Whisk to mix and add butter. Butter and sugar will melt and the mixture will become liquidy. Mix baking soda and vinegar and add to the mixture and mix well. Add ½ cup flour at a time and mix well using a wooden spoon. Use hands towards end to form dough. The dough will be extremely sticky and soft at first but will harden slightly as it cools. Flour the work surface and place the dough on it. Divide into 7 equal parts. Now preheat the oven to 180 degree Celsius. Take parchment paper and cut 10 inch sheets. You will need 7 sheets, one for each layer. Sprinkle flour on a parchment sheet and place the ball of dough. 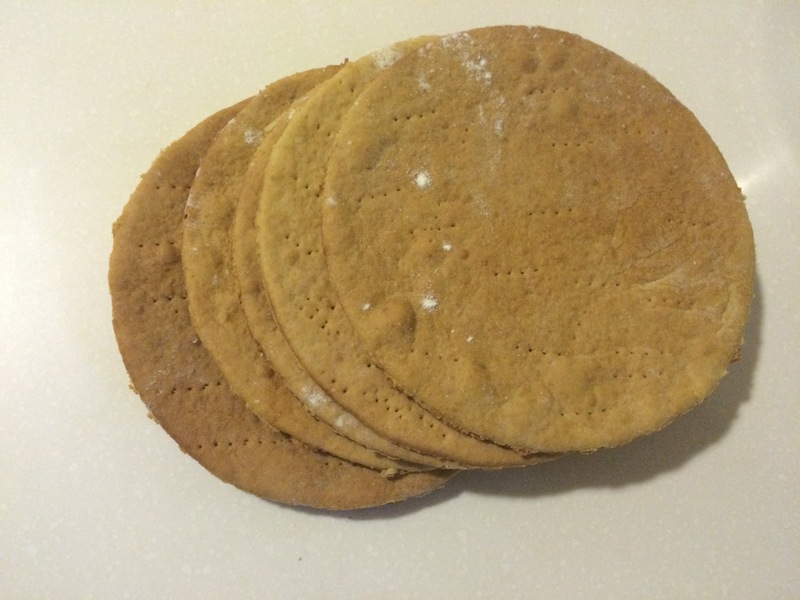 Sprinkle more flour on top and roll to a thin circle. 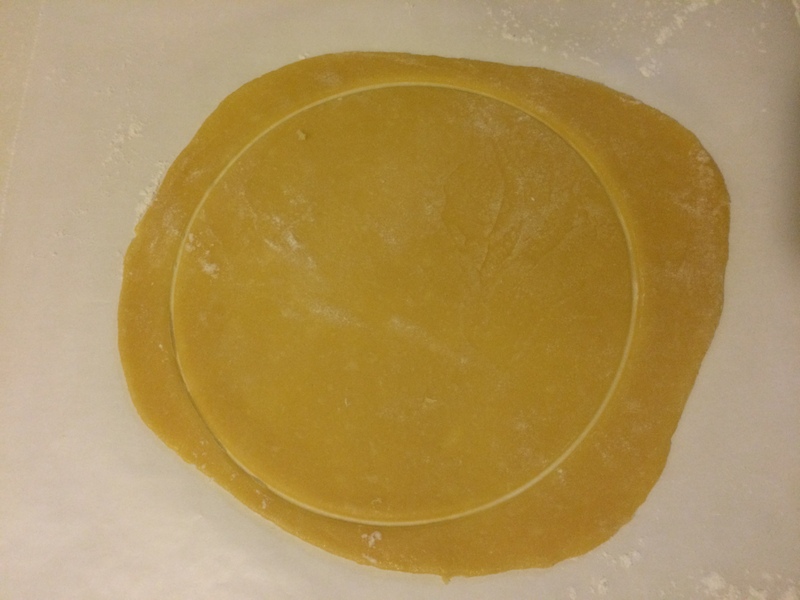 Use one 8” or 9” plate or bowl and press it down on the dough to mark a perfect circle. Place the parchment sheet on a baking tray and bake for 5-7 mins until lightly golden in colour. Roll the other dough and bake as you go. Cool the baked layer for few minutes and peel the parchment paper. Break the scraps on the circle to form perfect rounds. Keep the scraps aside. When cool, grind to a coarse powder and keep aside. Whisk the cream and sugar until mixed well and form soft peaks. Spread 4-5 tablespoon of cream evenly over the layer. Place another cake layer and repeat until all seven are complete. Cover the entire cake top and side with the remaining cream. Sprinkle the powdered crumbs on top and sides to cover. Place in room temperature 1 hr before you plan to serve. 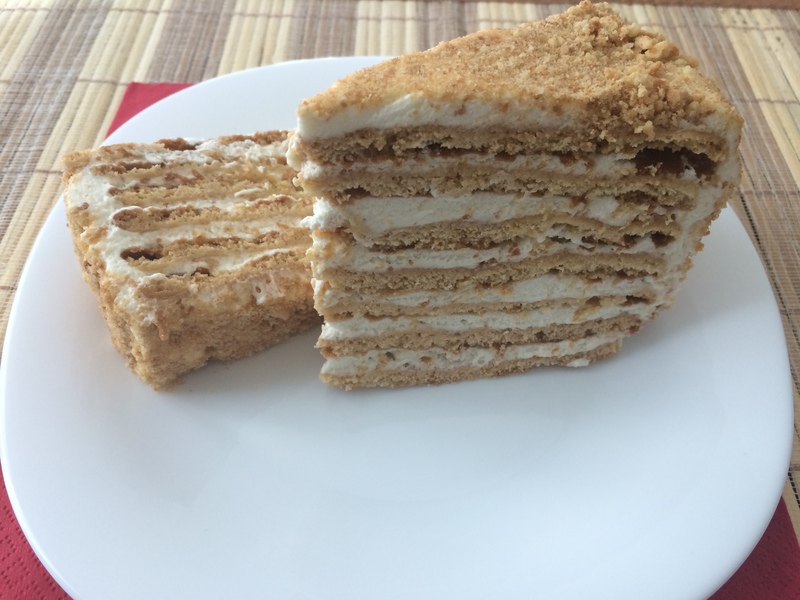 Slice and serve melt in mouth honey cake.